THE COMPLETE ROSARY- Pope John Paul II declared 2003 the Year of the Rosary and announced a new set of decades to meditate on while praying the Rosary - The luminous mysteries, also known as the mysteries of light. This 2-disc set contains all 20 decades- each preceded by a scripture meditation or short reflection, with instrumental background by David Phillips. One verse of a hymn is sung at the conclusion of each decade. 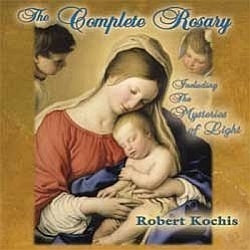 Following the Rosary is a medley of cherished Marian hymns.